National Union Party Secretary-General calls on Attorney General to investigate, ban Arab faction over support for Hamas. 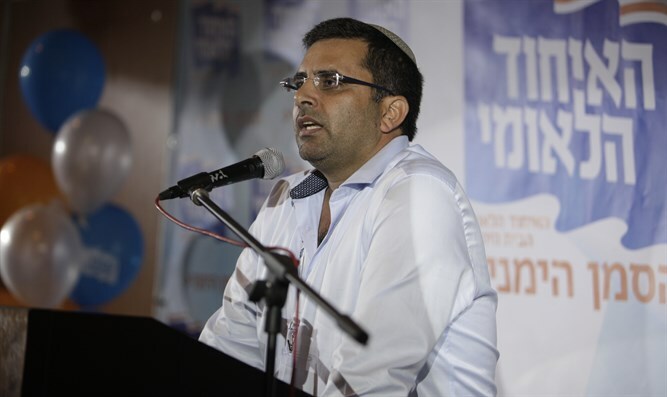 National Union Party Secretary-General Ophir Sofer sent a letter to Attorney General Avichai Mandelblit Thursday stating that ere is a strong suspicion of terrorist activity by MKs from the Joint Arab List faction. The letter was sent following the participation of MKs Ayman Odeh, Aida Touma Suleiman and Yousef Jabareen in the violent riots in Haifa last weekend. "This activity joins other statements made by Arab MKs, such as MK Aida Touma Suleiman, who said in an interview, 'Israel is a terrorist state,' 'in blood and spirit we will redeem Gaza', 'in many cases the Israeli government carries out terrorism,' 'I will not call Hamas a terrorist organization,' 'I will demonstrate and continue to demonstrate against the siege of Gaza and the occupation,'" Sofer wrote to Mandelblit. "The State of Israel is in a protracted war on the Gaza border, and such statements by MKs in support of terrorism constitute a serious offense and even treachery. Even freedom of expression has a red line," he said. "We call upon you to immediately open an investigation into the conduct of Arab Knesset members and to bring them to justice, and we demand that the joint list be prevented from running in the next elections. In the past, the CEC rejected certain lists on the grounds of supporting an armed struggle of a terrorist organization. We urge you to advance this move immediately," Sofer concluded.